I know I promised to do another video on cloning and I will, but I realized that I need to make the brushes that I am using available to everyone. I am making the Papers available, too. Please note: the brushes and the papers will only work in Painter 12. Some of the variants will work with earlier versions, but not in this set. I will need to separate them from the Real Watercolor variants. I will see what I can do. To load the papers, open the paper library panel and hit the options button. Select import paper library and navigate to where you downloaded the file. Here is a video giving you a little information about these variants. Hope you enjoy these variants and papers. This entry was posted in Skip Allen & Painter 12 and tagged Corel Painter 12 Paper Library, Corel Painter 12 Watercolor Brushes, Drips and Runs, Free Corel Painter 12 Brushes, Paper Drips Paper Library, Skip Allen and Painter 12. Bookmark the permalink. Painting Portraits in Painter or Photoshop Announced at The Artist’s Quarter. Now we have something to do on thursday for those of us that aren’t cooking! And also thanks as well for posting the papers, you certainly are appropriately dressed in the Santa suit, with all this stuff you keep sending our way. Drippy 01 or 02 should do the trick. You know I tweaked the brushes a bit more after the video, so they are not really the same, but those two variants should work. Drat, I’m cooking Thursday. Hi Skip, thanks so much for the brushes and papers. You are the best Santa ever! I so enjoy learning Painter from your great classes. I hope you enjoy the brushes and papers. These are luscious Skip. Thanks again so very much. Have a happy thanksgiving. Can’t wait to try these. I will be interested to see what you do with these variants. You master brushes at the speed of light. I love everything that you do. Your generosity and the ability to create these amazing brushes is fantastic. Thank you so much. I’m looking forward to trying them. I hope you like the variants and papers. I just found out that I need to change the paper for Macs…sigh. I’ll try and get that up today. HI, I’AM HAVING A BIT OF A PROBLEM INSTALLING THE BRUSHES. THE PAPERS INSTALLED PERFECTLY. I’AM REALY OUT TO TRYING THE BRUSHES OUT, THEY LOOK FANTASTIC. PLEASE HELP ME OUT!!!! PS I USE PAINTER 12, WINDOWS 7 PROFESSIONAL. THANKS FOR ANY HELP GIVEN. HAVE A NICE DAY. Sorry for the delay getting back to you. I’m not sure what to tell you. Can you be a little more specific with your question? Where and how have you tried to install them? Did you unzip the file first? Hopefully soon, I will add the files to the download page that Painter 12.1 uses and all the problems with installing brushes will go away. Thanks for dropping by. I’ll be glad to help as soon as you can give me a bit more information. Frist of all I want to thank you for your reply. Yes I unzip the file, went to the brushes and when I click to intall there no brushes, but the brushes are all in the the folder when I open it out of painter. PS Your work is realy grate work. Your truly an artist. I am sorry for the delay in my answer. I’ve been trying to figure out what you did. Here is an example of what I need for you to tell me. If it is easier to write in Spanish, feel free. 1. Unzipped the download and inside was a brush category folder and companion JPEG. User > AppData > Roaming > Corel > Painter 12 > Workspace name or Default if you don’t have a custom workspace) > Brushes > Name of a library > copy here. 3. Open Painter and looked for the brushes in the brush library panel. Found the brushes, but am not able to use them. You are working in Painter 12.1, right? OK…try to give me the information like I did above. Be very detailed with your response and do try answering in Spanish if that is easier for you…I think I will be able to get the answer better if you are not hampered with translating to English. 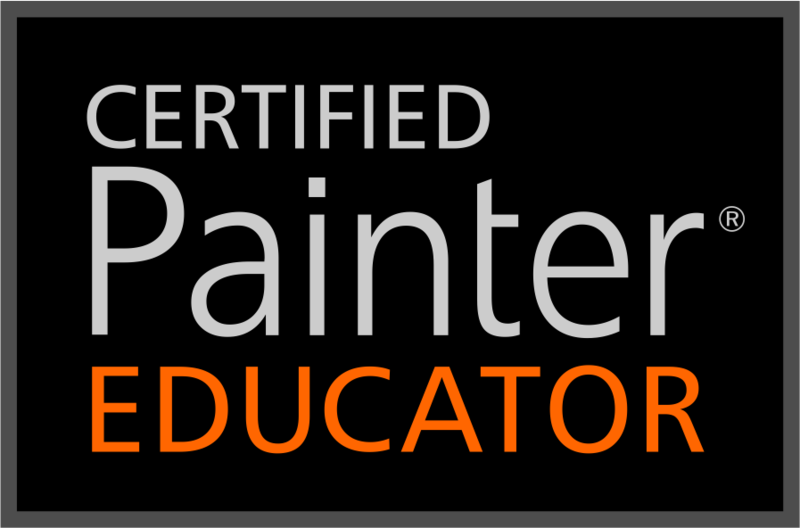 Skip, thanks for your tutorials and all the good work you do for those of us in the Painter world. I’m having a problem loading the papers library. Specifically, when I try to load the Drips and Runs.brushlibrary file, it’s grayed out and I can’t select it. Any ideas? I’m running 12.1 on Show Leopard. Thanks. Yes, there is a problem with importing Papers with a MAC. However, our king of Painter, David Gell, developed a fix. It is all explained in a late post on my blog: Correction: Drips and Runs Paper Library for MAC. Check it out. I don’t think I understand what you are telling me. I must be reading it incorrectly because what you are saying doesn’t sound possible. Are you using Painter 12.1 with the latest hot fix? Are you using a PC or a MAC? Which OS are you using? If you don’t mind, please write down the steps that you are using to install the brushes. I don’t understand what you mean that you install them into Painter 12, with a check by the same name in brush libraries. Ok…I think I understand. First I think there is some confusion about Painter 11 Brush Library. When you look in Painter at the dropdown menu, brush libraries, you see two libraries…one is Painter Brushes and the other is Painter 11 Brushes. If you select Painter 11 brushes, you will not automatically be transported to Painter 11, you remain in Painter 12, but now are looking at a library that is set up the same way the brushes were set up in Painter 11 program. That is all. I still do not how you installed the brushes, but I suspect that you put them in the file that said Painter Brushes instead of the file that said Painter 12 Brushes. That is the only way they can be in the Painter 11 Brush library. I would like for you to look at several videos for me. First check out: Where are those Brushes The sound is pretty bad, but stick with it. Next watch: Brush Management in Painter 12.1. On the same page of the previous link, there is a link to download a PDF called Brush Management for Corel Painter 12.1, A Primer. If you will watch the two videos and read the PDF I think you will be able to answer your own question. Also, in Painter go to Help > About Corel Painter and when the window opens, look at the middle left portion for a number that should end in 1250. If your number is anything else, then you do not have the latest Patch. From your original install, you should have installed, SP-1, 12.1 Updgrade, and Hot Fix for 12.1 in that order. If it has been installed, and you downloaded Drips and Runs as a library or category, then you do not need to do anything but double click it. Please, review the two videos and the PDF. If after reviewing them, you find you are still having a problem, please let me know. At that time I will give you an example of how to explain how your installed the brushes and I will need that very detailed information to help you. Chris Studio Brush manager isn’t available for Painter 12…I don’t think. I know Chris was working on one, but I am unsure if he finished it. If you used Studio Chris Brush Manager, the brushes were probably put into Painter 11 program. You can get Karen’s brushes in the latest format on Painter Talk. It is free to join and a nice site. To install Karen’s brushes if they are not in category or library format, you will need to install using the old method. You should use the User area to do this. The videos and PDF I provided should explain the method of doing it. You said something about your Appdata being empty…it probably is hidden. The PDF has a section telling you how to unhide those files. Thank you so much for taking the time to comment. I really appreciate it. I am glad you are finding the brushes useful. Skip…I have entered my name 3 times to subscribe, but so far haven’t received any mail. I am trying to learn Painter 12.2 and have been watching your webinairs with great admiration. I lost the place where you tell how to install brushes and would appreciate a pointer to where I can find that information. Then I plan to download some brushes and start painting. I used your email and put you on the subscriber list. You should get a confirmation email that requires a response. If you don’t get it, let me know. But, do check your spam. Hope this works, if it doesn’t, let me know. Something going on with my email…had to do a search (not in spam) and found the subscription it is dated August 5 and said I was subscribed, but I haven’t received anything. I hope it is okay now, but I did watch something (I think) where you showed how to install brushes in Painter 12.2. I found that you are subscribed, too. I haven’t added anything to the blog in a while…it may have been before you subscribed. If it was, then you wouldn’t have received an email, yet. I’ll be doing something in the next day or two…let’s see if you get the notification. I’ll send you a note via here when I next post. Hi Skip, I would like to download some of your brushes in Painter 12.2. Would you be able to tell me where these should be placed? I am afraid I am not too good at installation. It is very easy to load brushes in 12.2…the whole system has been updated. On each download page you will find two types of downloads for Painter 12.1. These work fine for Painter 12.2. You have one for installing the variants as a category and you have one to install as a library. You have your choice. For the category. Download the file and save it to your desktop or some place on your computer where you can find it again. Then open painter and select a library you already have…if you haven’t made any new libraries, then just open painter…the current library is fine. Now go to your file, which will look like this…drips and runs.brushcategory. Just double click the file and it will be installed in your current library. For the library. Download the file and save it to your desktop or some place on your computer. Then open Painter. You do not have to do anything at all in Painter, just have it opened. Now go the the library file, which will look like this drips and runs.brushlibrary and double click it. It will install automatically as a new library in Painter with drips and runs in the library. Hi Skip, I am new to Painter but have been doing digital art for some time. I have been experimenting with pretty much all the brushes you have here not just drips and runs. I installed everything fine but when I use the brushes they don’t react or look like what you have in your videos. They seem to diffuse or “run” but it is a very limited effect and not at all like what I see in your videos. Even using your papers. I tried making a smaller image to paint on and that didn’t work either. I am running 12.2.0703 on Windows 7. Your brushes seem to work just like the default painter watercolor brushes without the extreme drip effect you have in your videos. No idea why. Any suggestions? Thanks by the way for all the content you provide on your site. Amazing. Much appreciated. I think my problem was just a glitch. I restarted painter and eventually got pretty much exactly what you had in the videos. I love your brushes. I am trying to learn how you make them so I can make my own. So many settings!! Thanks again. You have been a big help. There are lots of controls for any brush…sigh…but the good news…with a little play it all falls into place. Good luck on your brush making venture. Holler if you need any help. Hi Kenzie…sorry you are having trouble, but glad you found a solution. So glad you like them. Have fun. Greetings Skip in which folder does the paper file go into. I placed it in the Resource –> Paper folder but does not come up. Installation is much easier than that. 1. Open Painter and make a new document or open a document in progress. 4. From the list that opens, select import paper Library and navigate to where you have the paper library and select it and click open. It will appear in your Paper Libraries Panel. If you are using a Mac, you may need a script that David Gell has provided. I don’t have a Mac and I am not sure if the glitch that we had with sharing libraries between platforms was fixed. I think it may have been, but not sure. Hi again, Skip. I saw a blog yesterday by this woman, https://wordpress.com/read/blog/id/59901653/. I thought it would be really wonderful if I could try to do something like this in an abstract. I have always wanted to be able to get long drips, such as acrylics do when sprayed with water and then they run down the paper. I asked at DAA FB page about this, and several people mentioned the Runny Drips brushes. I, however, forgot about the paper. So I got very frustrated. Then I read Kathy Pilgrim’s response and she mentioned the papers. Wow. I watched the video and now I’m ready to go explore and see what I can come up with. I’m really excited. Thanks so much for the brushes and papers. You are so generous. Loved the work in the link that you provided. If you are trying to get that look…a runny acrylic or oil look, you might enjoy using Real Wet Oils instead of Drips and Runs, which are watercolor brushes. Check out this webinar I did about Flow Maps and Real Wet Oils. I did a second one the same day…2nd Real Wet Oils and Flow Maps Webinar. I’m sure you will want the brushes that I used in the Webinar and you can find them here. Have fun…I think you will like this approach much better. Hi Skip, I was wondering if Real Wet Oils might better fit what I’m trying to do. I’m so glad you let me know. I just finished lunch and was ready to dive into the Drips and papers that go with them. I did see one video on flow maps by you. But I was new to Painter, I don’t think it sunk in. I’m off to watch these videos. Thank you soooo much. I’m sure you’re right too, as I did play a bit with the Drips before lunch. I couldn’t get what was in that work I showed you. Hi Skip. I just wanted to let you know that I have found exactly what I wanted. It ends up that the watercolor flow map brushes are probably going to be what I use. The look is luscious. I’m so excited. Thanks again. Thank you Skip for all the brushes and papers you provide, and to personally explain how to use them. I love what you are doing. I am going to love creating my expression of art with these brushes. Thank you very much Linda for you nice note. It is always exciting for me to hear folks are enjoying the blog and the brushes. You made my day. Just getting into digital art…what sort of input device (s) r you using? My main input device is a Wacom Cintiq 24″ HD Touch, but I started with an Intuos Tablet. I still have my intuos 5 tablet. I also work on a Surface Pro 3 with its RTS touch screen. I highly recommend Wacom tablets. The Intuos Pro would be very good for anyone. But, Cintiqs are sweet. Thank you so much again for your generous sharing! You are an inspiration to all of us!